3. The Neutritron as Source or Carrier? Welcome to Issue 24 of SHAPE Journal. 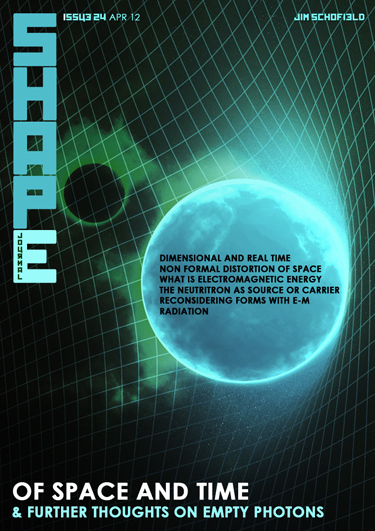 This issue of SHAPE is unusual in that it gathers together a series of recent papers precipitated by a long and concerted attack upon the so-called Copenhagen Interpretation of Quantum Theory. It started with the ubiquitous Double Slit Experiments, but quickly forced a more general reassessment which could not but include Cosmology and Einstein’s formal contributions upon the assumed framework of everything - Space & Time. It is not the coherent and comprehensive work that was originally planned for a Special Issue on the subject - this will follow in the relatively near future - but it does lay down a few precursors of an entirely new approach, which arose out of other Sciences - particularly Biology and primarily Darwin and the following Evolutionists. But this collection does indeed tackle the philosophic ground of giants such as Einstein, Bohr and Heisenberg and shows in a fragmentary way where their transformation of Physics has unfortunately led. The Blog, meanwhile continues with its series on Socialism.